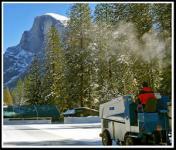 While the Great Horned Owl is otherwise engaged and proving elusive, we did recently manage to capture a fleeting glimpse of the "Great Icy Rinkus Zambonicus," better known to Peanuts comic strip fans simply as the Zamboni. 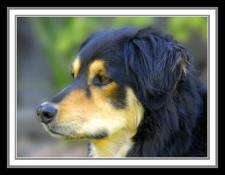 "Shasta the Wonder Dog," who many believe could have been the model for the computer-animated character 'Fly' in the hit movie "Babe," was in Santa Barbara recently and stopped by the Magical Light Photography portrait studio for a publicity still. With much excitement we recently found the nesting site of a Great Horned Owl (see photo in 'Wildlife' gallery) located in a large Blue Oak near Lower Yosemite Fall. While we cannot yet tell if a mate has been found we will be regularly training our lens on the tree cavity and its occupant(s) during the next two-four months to monitor nature's progress.